This piece on garden fences was written by freelance contributor Sally Perkins. Check out her website www.oudoorartpros.com. Dogs love being out in the garden, playing, sniffing, digging and exploring their environment. A good doggy garden needs to be secure so you are certain that your dog can’t get out, or into the neighbor’s garden, where they might not be welcomed visitors. Investing in good quality garden fencing is essential. You might also want to put smaller fencing round flower beds or vegetable patches to make sure that your dog keeps out of areas you want kept beautiful. Some breeds of dogs are notorious for digging, huskies and spitz dogs create earth bowls to roll and sit in to keep cool. Terriers love to go digging to search for vermin and rodents and this can cause damage. Beagles and basset hounds commonly dig under fences to try and get to prey like squirrels. Younger dogs are often the culprits when trying to make a bid to escape under garden fences. Installing vinyl or PVC fencing that goes below ground level, protecting your dog from getting into any mischief. Some dogs are not diggers, but acrobats – they love to jump over the fences. Rather than putting up fences that are too high and obstruct the view out of the garden, it is a good idea to plant large, bushy shrubs in front of your fences. This will be a deterrent to dogs that are high leapers. Boxers are famous for this. When you are creating your dog friendly garden, just make sure that the shrubs you plant are not of a spiky variety. If you already have slatted wooden picket fencing around your home, using wire safety mesh is a good way of keeping small dogs from escaping the garden. Chihuahuas and toy breeds of a similar size can easily slip underneath fences. Look for a galvanised metal that doesn’t rust. 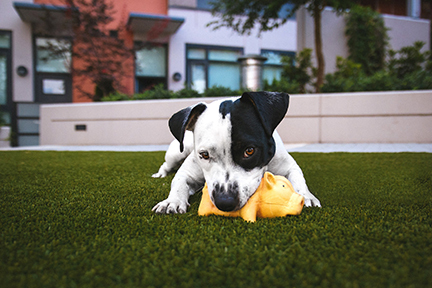 Using mesh is a cost-effective way to ensure that your dogs is kept safely in your garden and can easily be taken up or down using heavy duty tackers and staples. It is unobtrusive and won’t detract from the quality of your picket fence. Dogs are true members of the family and keeping them safe is important. The garden is somewhere that dogs can run around and enjoy being outdoors, and a good quality fencing means that they can be secure and happy.